If Finestra Virtual Desktops (free/donationware) hadn't crashed on me once or twice, it would've scored at least a half star higher than the 3 stars that I gave it. It's that elegant and suited to the task. The program allows you up to 100 virtual desktops (four's plenty for most folks), has a host of options so that you can control which programs open on which desktop, etc., and even makes great use of the Windows 7 live window thumbnails. Finestra's switcher allows you to easily drag windows and applications between desktops. A small download with a small memory and disk footprint, Finestra Virtual Desktops requires only a little time and effort to install. You run the program as you would any other, and you'll find it sitting on the taskbar. Hover the mouse over it, and you'll get a Windows 7 live preview the virtual desktops. Cursor over them and you see each desktop in full preview. This makes it far easier to keep track of where things are with Finestra Virtual Desktops than it is with most virtual desktop managers. So as not to interfere with Windows 7's use of the edges of the desktop, you can't move programs about by dragging off-screen. Instead you open the Switcher which shows all the available desktops and lets you drag programs and windows between them. This was unfortunately where Finestra Virtual Desktops kept crashing on me--about every third time I tried to access it. It was very polite and put all the programs back on the original, single desktop, but it was no longer in operation until I restarted it. Since you'll probably only need the switcher occasionally, the program is still usable. 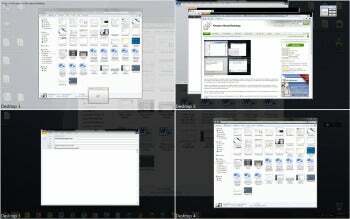 Options abound in Finestra Virtual Desktops. You can have programs open on alternate desktops, name desktops, and change hotkeys just to name a few. There's also a mini-desktop-switcher that you can keep on screen if you don't have Window 7 or want something without previews. All in all, and especially for Windows 7 users, Finestra Virtual Desktops is the best virtual desktop manager I've used--in spite of the bug. Hopefully that critter will be squashed by the time you read this. Download it and find out. When it is, consider donating some cash to the authors to continue development. Elegant, feature-rich virtual desktop manager Finestra works very well--most of the time.